Photo credits: Rich and Strange Photography (left) and Haythem Lafhaj (right). 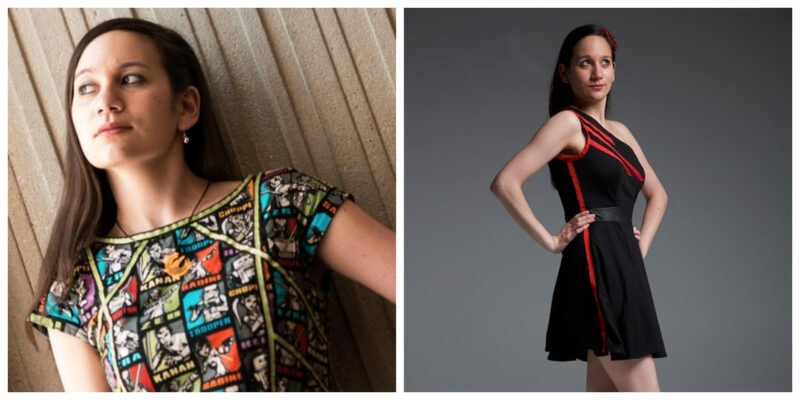 Bria LaVorgna is a contributing writer to the official Star Wars website, Managing Editor for the blog side of Tosche Station, and member of the 501st Legion and Rebel Legion (and that doesn’t cover everything!). She was kind enough to answer a few questions via email for this interview with 365 Days of Star Wars Women. My Star Wars introduction was so long ago that I don’t actually remember it but I’m told my uncle was babysitting me for a few days when I was two and introduced me to both Star Wars and chocolate cake on the same day. So a pretty good day. Once the Special Editions came out and I discovered there were Star Wars books too, I was hooked and the Prequels sealed it. Picking a favorite is hard! Heck: I refuse to even rank the movies anymore because I love them all for different reasons. I’ve always been a fan of the X-Wing books by Mike Stackpole and Aaron Allston. Wraith Squadron means everything to me and I’ll always love that bunch of misfits. I’ve also always been a Leia fan. 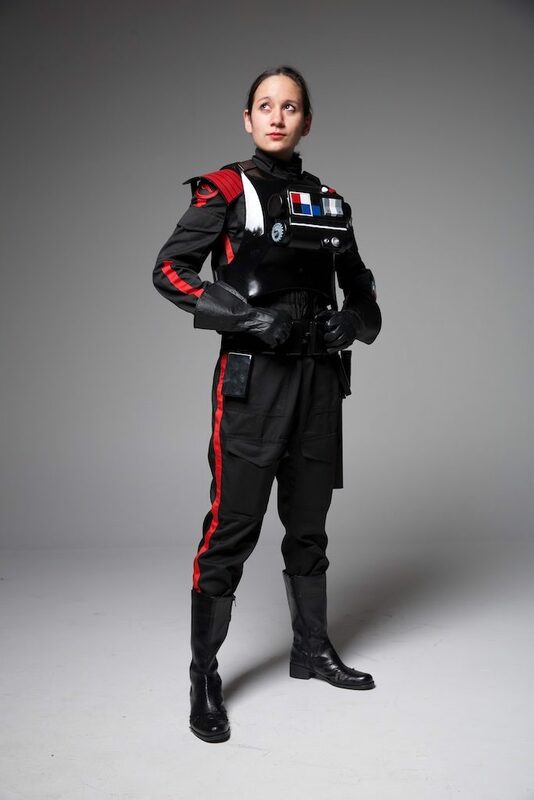 There’s probably a picture of me dressing as her for Halloween as a little kid somewhere… Now my favorites include characters like Iden Versio and Doctor Aphra (who I connected with because they’re different aspects of my personality and kinda look like me) and books like Bloodline and Inferno Squad. I wouldn’t say that my favorites change so much as I make more room in my heart for these new characters and stories right alongside those I’ve loved for decades. 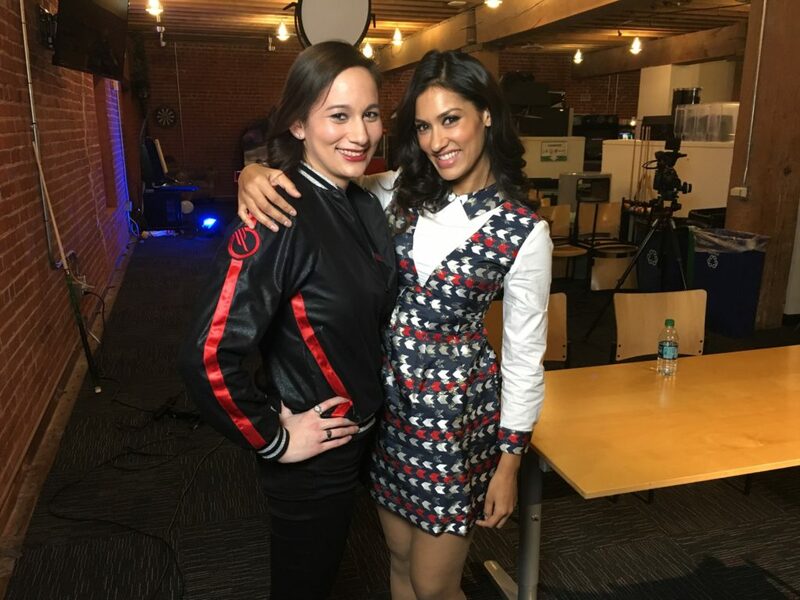 Bria with Iden Versio actress Janina Gavankar. The IGN video where you are surprised by Iden Versio actress Janina Gavankar is to me a perfect Star Wars moment because you were both so obviously excited to meet each other after following each other online for months and both loving the same character. What was that moment like for you? In a word? Incredible. Everything happened very quickly; I’d only had the dates of the trip confirmed a few days before so it all felt a little surreal. In case it wasn’t obvious, I had no idea Janina was there. When I got to the IGN offices that day, they said they were doing another interview before mine with “one of the developers or something” and so they were running a little behind and I completely believed them so everything you saw on screen was my genuine reaction although thankfully they cut out most of my happy crying. I already felt incredibly lucky to even be a part of that video and Janina being there just made it perfect. She couldn’t have been nicer and it was wonderful getting to talk about Iden’s story with her because she understood why the character meant so much to me and didn’t think it was weird that I loved Iden so much just from seeing that first trailer. Battlefront II was truly the one Star Wars story I never could have anticipated in a thousand years that it would change my life and yet here we are, a year and a half later. Everything about Iden’s story has resonated with me so deeply and the fact that she actually sorta looks like me (something that doesn’t happen very often for this mixed race Asian girl) made that connection all the stronger. I’m grateful I had garrisonmates willing to help me put the initial armor together so quickly and somehow even more thankful that Mitch Dyer, Walt Williams, and Christie Golden wrote a game and a book that mean so much to me. I still haven’t been able to watch The Last Jedi at home yet because I know the opening will make me think of Inferno Squad and cry just like I did every time in the theatres. Meeting Janina thanks to the IGN video made for a perfect day and I’m not sure it’s possible for me to have another Star Wars moment that can top that for me. In episode 4 of Behind the Cosplay, IGN’s own Alanah Pearce(@Charalanahzard)​ talks to the very first Iden Versio cosplayer and reveals the one she’s built to Iden Versio herself, @Janina Gavankar​. I think it has to be a year or two after the Battle of Jakku. It’s a time of relative peace and a lot of my favorite characters are still alive. (I really don’t want to be dropped in the middle of a war zone.) It could be fun though! I’m thinking maybe swing by Coruscant and Naboo and then hop over to Chandrila to meet Leia, Han, Luke, and Lando. Oh! And I could track down the Corvus and meet Iden and Del! And then go back to Naboo because it’s really pretty and probably not going to get involved in another galactic war any time soon. Hopefully. When did you start talking with other fans about Star Wars online? Did it take a while to find places you felt were a good fit for you online? Oh boy. I’m about to date myself here. I was on the StarWars.com forums probably around the time Attack of the Clones came out but lost my password and it wasn’t really until 2003 when I joined TheForce.net’s Jedi Council forums that I really found an online home. I started in their fanfic sections and then eventually slide into the JCC and the EU Community areas. I still talk to some of the friends I made there to this very day. It’s a little crazy to think that I’ve got inside jokes with some of those friends that are over a decade old. Some of the friends I made there transferred over to LiveJournal and eventually Twitter and are ultimately responsible for me being as much of a part of the Star Wars community as I am today. 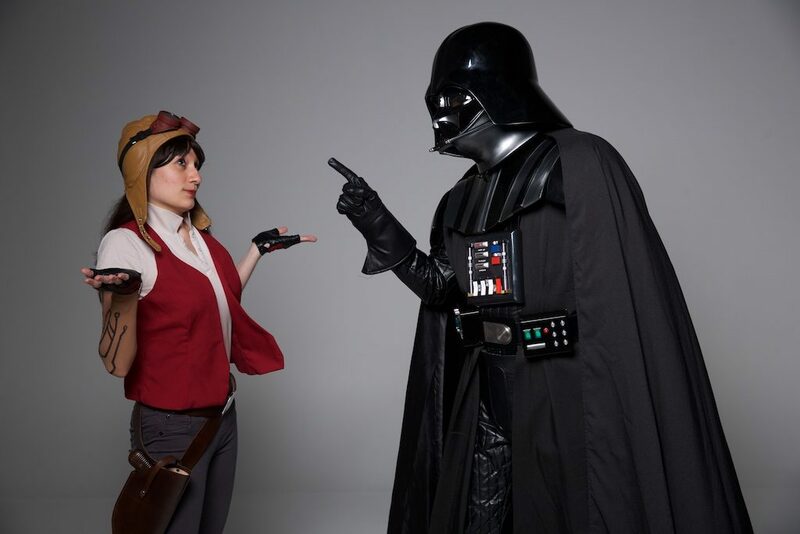 What do you consider to be your first Star Wars cosplay? Do you have an overall favorite cosplay you’ve done? I’m curious if you ever consider your costume work to be done or if you find yourself making alterations/upgrades a lot. I was 15ish, I decided to make a Barriss Offee costume for Halloween. It was… okay. It wasn’t bad for a 15-year-old back in the early 2000s but definitely wouldn’t hold up now. (I remade it a few years ago and considered that my costume redemption.) It’s hard to pick a favorite costume since it’s sorta like picking a favorite child. Plus, my favorite tends to change from year to year. If I had to pick though, it’s probably Iden for obvious reasons. I’m also really fond of my Jedi Mulan mash up I made for Celebration Anaheim and my Marvel Comics Leia which was recently Rebel Legion approved. Oh! And Aphra wasn’t a technically challenging costume for me but she’s so fun to wear especially if there’s a Vader around. Whether I consider a costume done mostly depends on whether I’m planning on wearing it again and also how much I care about the character. Costumes I wear to troop in usually end up requiring minor repairs from time to time. For others, like my Visas Marr, I’ve had upgrades in mind since I first finished it. The gloves have been redone already and at some point, I’m going to go back and remake the veil to have the gold pattern be embroidered. And then there’s Iden, of course, which is almost completely new or at least somewhat reworked from the very first time I wore the costume to a convention as we got better looks at her flight suit and armor. So in other words… it depends. You’re a member of the 501st and Rebel Legion. For people not familiar with these organizations can you explain what they do and how you can become a member? Can you share some favorite moments of yours from your time with these organizations? The 501st Legion and the Rebel Legion are two international Star Wars costuming organizations where we express our love of Star Wars via screen accurate costumes and take part in various events in the local community to try share that love and give back to the community. The 501st covers the bad guys and Rebel Legion covers the good guys. I’ve been a member of the 501st for two years now and the Rebel Legion for about two months. The requirements for membership are fairly simple: you have to be at least 18 and have a screen accurate Star Wars costume. If you’re interested in joining, I recommend signing up on the forums (your local garrison for 501st or the main boards for RL) and start chatting with other members. We’re always more than happy to share our expertise and our love for Star Wars and lots of garrisons tend to host something called armor parties where we help each other with costume building. Very few people put together something like stormtrooper armor all on their own. Basically, if you’re interested, reach out to your local garrison or base. As for favorite moments… there are a lot! One of my favorite things about trooping is getting to interact with the kids but especially with young girls. For so many years, people have (erroneously) insisted that Star Wars is a boys thing instead of an everyone thing and so it’s wonderful getting to see girls have that realization they can be a part of this galaxy too. At a recent local convention, two young girls came back to our table and asked me to sign all of my trading cards for them and that was a very special moment for me. I also recently had a very moving experience at a children’s hospital. Members from our garrison visit on a monthly basis and take a few hours going around and spending some time with the kids to do what we can to brighten their day a little. It was where my very first official 501st troop was and is one of my favorite events to take part of whenever possible. This particular visit was my very first troop as Leia and I was honestly a little nervous because there’s a legacy that comes with being the Princess and I would never want to dishonor those buns/braids. We met this one girl who I think was maybe 11 or 12 years old and she was a huuuuuge Star Wars fan and had this big grin on her face as soon as she saw us. One of my basemates had 3D printed Han Solo dice and put them on gold chains just like in the movie so we could give them out. This girl and I were chatting and at one point, I told her to hold out her hand and pressed the dice into them and told her that they belonged to my husband Han and they’d brought him a lot of luck in the past and that I wanted to give them and the luck to her. The expression on her face made it hard not to tear up until after we’d left her room and one of our stormtroopers immediately gave me a hug. 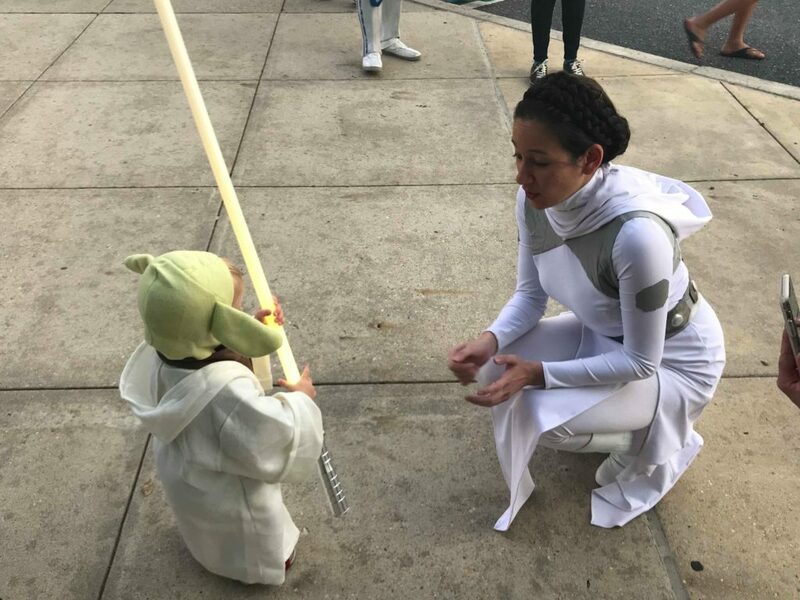 I love just about everything about getting to be a Star War on the weekends but having meaningful interactions like these make it all worth it. You’re very active writing and podcasting about Star Wars. Tell me about your roles at Tosche Station and White Hot Room and what kinds of content Star Wars fans can find there. I’m currently the Managing Editor for the blog side of Tosche Station. We’re part-blog, part-podcast network and have pieces and podcasts talking about almost every aspect of Star Wars you can think of with a focus on the books/comics. I tend to write book reviews and columns about whatever happens to be on my mind there. I used to write the comic reviews there but have been slowly handing those off to my writers for reasons that may or may not have to do with my writing about Star Wars comics elsewhere. We’re also really excited that Resistance has begun and to cover the show. White Hot Room is a geek fashion site that I run with a friend of mine. We used to be a bit more active but currently, it’s mostly where I post my geek inspired outfits, Star Wars and otherwise. A decent proportion of them tend to even be ones I wear to work. I’m a huge proponent of nerdy professional wear and subtly geeky designs. That’s why I have so much love for companies like Musterbrand and Prophecy Girl; not everyone wants all of their geeky clothes to have ‘STAR WARS’ plastered on it. For podcasting you are one of the hosts of Kanjikast and the Vongcast. What’s appealing to you about podcasting (particularly about the subjects these two podcasts focus on) and do you have a suggested episode for both of these podcasts to listen to for people who may be new to them? I sorta fell into podcasting. I’ve been guesting on podcasts for about six years now but never really had the urge to host my own as I’m more fond of writing. The Kanjikast came about because I (and my cohosts Brian and Jay) were annoyed at some of the fan reactions to Iden in regards to representation and so we decided to start a podcast from the point of view of three Asian American Star Wars fans. It gives us a chance to not only highlight the Asian characters within the galaxy but to also discuss issues from our unique points of view and maybe open some eyes to a vantage point unlike their own. Our episodes all stand alone so if someone wants to start listening, I’d say just pick the character that appeals to you the most although I’m pretty proud of our super sized Aphra episode. We brought on two other Aphra cosplayers to talk about their love for her. The Vongcast was something that Megan, Rocky, and I had been talking about for ages and then finally decided to move forward with this year. And now we’re working our way through the New Jedi Order series by reading a book each month. I couldn’t ask for better partners in crime for the project as we all really love the NJO. It’s basically the best book club ever. In any given episode, we range from cracking ridiculous jokes to verbally writing fanfic to having really deep conversations about symbolism to yelling about how the Solo kids are actual children and should not be fighting a war. The pilot episode talks about why we decided to do the podcast (it’s because we love the series) and the first real episode covers the first book. How did you become one of the contributing writers to the official Star Wars website? Do you have a favorite piece that has run there so far? What kinds of articles/interviews are you hoping to do in the future for this site? Pure luck? The short version is that they were looking for someone to do an interview with Kieron Gillen about his work on the Doctor Aphra comic and my friend Bryan recommended me since I have a liiiiiiittle bit of a reputation for being an Aphra fan. The interview eventually expanded to also include Si Spurrier and was an awesome experience. Both Kieron and Si are delightful human beings and I felt lucky to be a part of their conversation about this character I love so much. I couldn’t have asked for a better introduction and it just might be my favorite piece that’s run there so far. I also had a lot of fun putting together the list of my 10 Favorite Marvel Comics Moments so far. The research for that one involved me sitting at home all weekend surrounded by all of my Star Wars comics as I tried to narrow down the list to something manageable. That said… the Vader Down moment was the first thing I put on the list. As for future pieces… well, that would be telling! 😉 I’d love to be able to do some more interviews with creators but that’s not up to me. In all honesty, I feel very lucky to be writing for StarWars.com especially since they’re letting me write a regular column about the comics. I was feeling very burnt out at the beginning of the year because I’d been writing reviews for every single issue of the Marvel comics for a few years. The column’s been a great way for me to still engage regularly with the medium but also not feel like I’m writing repetitive reviews about each issue. Hopefully, I’ll get to keep writing it for many months to come. You’re obviously a huge fan of Star Wars books and comics. What would be your dream Star Wars comic and/or book? You mean aside from the obvious answer of an Inferno Squad 20 part series by Christie Golden, Mitch Dyer, and Walt Williams? 😛 Generally speaking, I’d love to see Aphra get a full novel or to see Jae Lee draw a Star Wars comic but an answer popped into my mind earlier and now I can’t shake it. I’d love to see Pierce Brown write a Revan trilogy that follows her through the Mandalorian Wars and her fall to the dark side and ends right after Malak betrays her/when the first Knights of the Old Republic game picks up. It would hurt a lot but it would be ohhhh so good. You can find Bria on Twitter and Instagram @chaosbria.